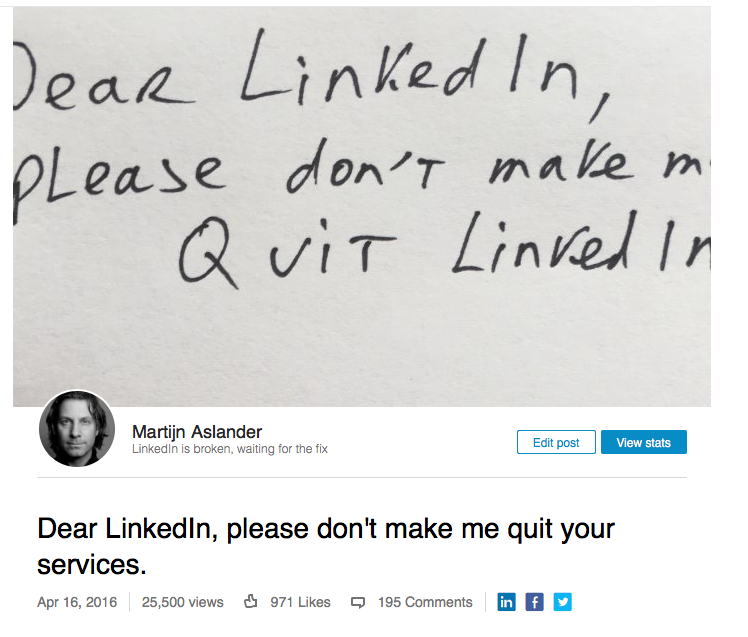 Since the beginning of LinkedIn, I’m one of the most prolific advocates of your platform in the Netherlands. But, with the influx of invites that a known writer and speaker in my country gets on a daily basis, you recently made it impossible for me to accept new contacts because of a design change. What happened? I ALWAYS reply to people that invite me without saying why they want to connect. Being invited by a complete stranger feels like meeting someone on the streets that invite you to suddenly become friends. I don’t think that is a good strategy to build lasting networks of trust. A few years ago, it was easy to send an invite with an extra message with the reason to connect. A sensible and friendly approach. With the rise of apps, that option, especially on the iPhone disappeared. The next step that made me unhappy was the following: I used to be able to respond to an invite by email, contacting people that want to connect with me directly. And i used to asked them where we met and why they want to connect, with gave me a sense of context of the newly to-be-build relationship. I changed my strategy and used something you call InMail to ask them the reason to connect. And now, I ran out of InMail point/tokens/whatever-you-call-them. 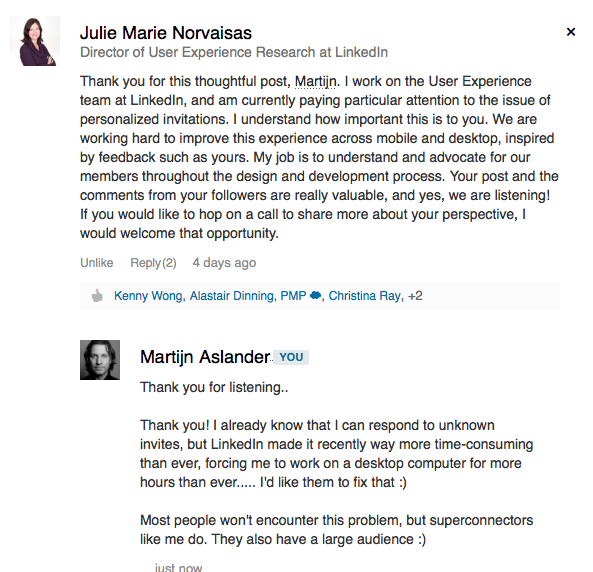 Basically, I cannot ask unknown people anymore why they want to connect, with makes this whole platform useless to me. I already paid to premium services but now its becoming ridiculous, aside from the fact that maintaining my LinkedIn network costs me more time than ever as a result to your policies to get more people to spend time on your platform. I strongly urge you to do something about it, or else I sadly have to leave this, not so long ago great, platform. De post meer dan 27.000 keer gelezen, meer dan 1000 keer geliked en heeft meer dan 200 reacties gekregen. 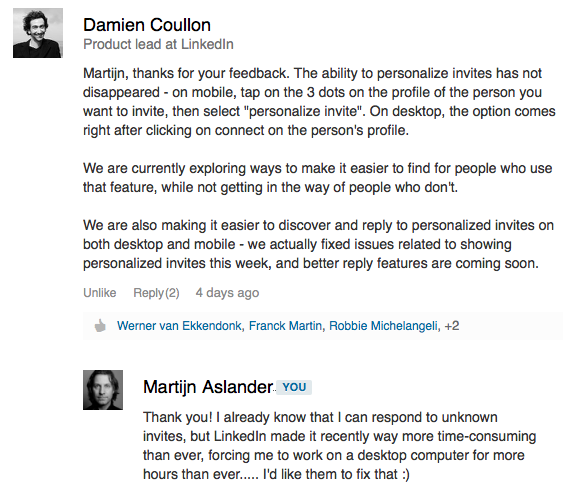 Ik heb inmiddels contact gehad met de directeur van LinkedIn Nederland die me heeft beloofd er serieus naar te kijken. En tot die tijd moet ik het doen met een geweldige tussenoplossing van Joost Plattel, die eventjes een open source chrome-plugin voor mij schreef, waardoor effectief gezien alles weer bij het oude is.